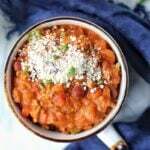 This fall-spiced pumpkin chicken chili is perfect on a cool afternoon when you want something warm, comforting and cozy. Heat oil over medium-high heat, saute the onion for 2 minutes. Add in the rest of the veggies (pepper, jalapeno, garlic) and saute for 3 minutes. Add chili powder, cumin, turmeric and salt to the veggies, then cook for 1 minute. Add the diced tomatoes, pumpkin puree, drained kidney beans and water (see note below on amount of water). Bring to a simmer for about 30 minutes. Ladle into bowls and top with your favorite add-ons (I like sour cream or plain Greek yogurt and parsley, but you could also add parmesan cheese, chives, some sliced jalapeno or anything else!). Cooking spices brings out their flavor, so make sure to let them cook for the minute before adding the meat. You could use ground turkey as an alternative to the chicken, or even try some crumbled tofu or meatless crumbles for a plant-based option. You may want to start with 3/4 cup of water but add up to 1 1/2 cups if your chili is too thick. Prefer less spice or want to make it more kid-friendly? Only use one jalapeno, and offer sliced jalapenos or hot sauce at the table.